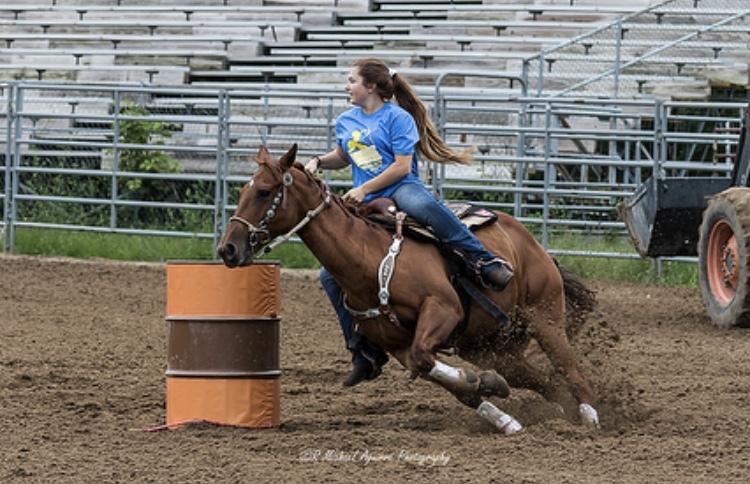 CFHS sophomore Haley Affolter is an accomplished barrel racer. Riding a horse requires bravery, profound practice, and commitment. Unlike common household pets, such as cats and dogs, horses are wild animals that must be tamed to become domesticated. A horse’s stature and towering size creates an element of danger. Consequently when lacking an understanding of a horse’s behavior the rider becomes endangered to countless serious injuries and accidents that could occur if someone is inexperienced. To be a successful barrel racer an individual needs to focus on one very important element: communication. Between the rider and the horse, communication is like a third language called an “embodied language system” meaning the “language of touch”. Haley Affolter, a passionate sophomore, is the perfect example of what an amazing barrel racer looks like taking sports to a whole new level. Through her journey of competing in barrel racing, Haley has discovered the art of patience and trust. Her journey started when she was only seven years old. With the influence and support of her mom, she took hold of the reigns courageously. Her mom taught her how to ride and has taken Haley to compete around Minnesota. Texas and Oklahoma are a couple of states that she has recently traveled to for barrel racing. Haley says that she’s very competitive in the sport, she definitely plans on doing it in the future, and along the way she’s making her own memories. “My mom and I were on our way to a show in Texas and blew three tires on the way and we had to call triple A since we didn’t know how to change them” she says. “It took us a day longer than we needed to get there, but that was funny.” Haley’s competitions consist of racing individuals from other states and to eventually qualify for bigger races. Haley is spurring into her dreams of competing in the National Finals Rodeo (NFR), and is eager to keep growing in order to attain her goal. Without her two horses, Haley’s racing career wouldn’t be possible. Her first horse, Mighty, is a black horse and she will be racing with him next year. Her other horse is named Hickory and she is a chestnut brown colored horse. When Haley competes, she effortlessly shows her bond between her and her horses. Anyone watching them can see how connected they are. To have two bodies working as a single unit takes empathetic physical dialogue. Haley mentions that racing makes her very patient and teaches her how to really trust an animal, but trust goes both ways. Not only must the horse understand what the rider is trying to do, but the horse must also trust that the rider will not put them in danger. She adds that she’s learned overall that things take time. Originally Haley was terrified of being on a horse, but now she competes against people of all age levels. Racing has brought her the cultivating success as well as rewarding and sweet experiences. Haley shared her proudest moment saying, “When I first started racing I was in the ten and under pee wee division which is for kids and, I won the state championship. It’s one of my favorite memories.” Through her astounding success she has had life changing experiences that have shaped her into the person she is today. Harmonizing with her horse while riding around barrels in a synchronized motion takes years to master, but somehow Haley makes it appear effortless. Her passion for riding and relationship with her horses stands out as she fearlessly holds the reigns.